In the course of our nation’s history at times it became necessary to accept and recognize unlike and objectionable ideas in order to sustain harmony among the various and essential ingredients making up our unique civilization and humanity. The adoption of the Christian faith after five thousand years of worshipping Ishtar, Marduk, and Ashur; the use of Aramaic language instead of Akkadian; writing with 22 letters instead of some 700 cuneiform signs, and even the election of our most revered religious leader instead of accepting the hereditary assumption of power are only a few examples. Such transformations gave rise to decades of battles, divisions, and even dissolution. To repair and renew the constantly fragmenting fabrics of our society we have compromised much so that we may convert to a more just, productive, and responsible culture. At the end of our long and historic concessions what emerged was a resilient nucleus of our Mesopotamian identity that guided us through genocides, world wars, and aghast miseries with implausible determination to survive. Today, in spite of divisive forces all around us, our denominational differences, our tribal affiliations, and struggle to form ourselves into a nation in the modern sense, we have once again reached another such historic juncture. The external forces and the internal events shaping the geography, fortunes, and the political layout of our homeland demand a more cohesive and powerful leadership and camaraderie unlike anything we have witnessed in our lifetime. Hence, with tolerance and wisdom we must work together to unite. After seven thousand years we stand before an unsurpassed future, behind us a glorious ancient history, magnificent social and political achievements and the most bitter moments in the annals of humanity. We have come to the beginning of the end, the point of no return, where we must become conscious of that most important truth about our existence, that nothing has and will ever embrace the whole of our Mesopotamian existence. In seeking unity we must first seek our common denominators. In the past our religious practices and political ignorance divided us into many denominational and ethnic fragments. It is our duty to find common grounds to undo the mistakes of the past and dismiss any sources of contention and dissection among ourselves. Upon closer examination we find our most sacred and long-established attributes that distinguish us from every other nationality in the Middle East engraved in three qualities: our historic origins in Mesopotamia, our Aramaic language, and our Christian faith. Many among us accredit these qualities to an “Assyrian” identity only, whereas others among us feel similarly about their “Chaldean”, “Syriac”, and even "Nestorian", “Aramean”, "Jacobite" or “Maronite” identities. If we all share these qualities, then we must have derived from a single earthly foundation. On this basis, our unity should be based on the fellowship of all Aramaic (or Syriac)-speaking Christians bond together by history, language, and religion and progressing toward a single destiny. The time has now come to break with tradition. We must uncompromisingly demand a unified nation of many identities, founded in the holy trinity of our Mesopotamian roots, Aramaic language, and singular Christian faith. The gulf between Assyrians, Syriacs, and Chaldeans is widening as our non-Christian neighbors become more engaged in our internal affairs. They are now employing a few of our own men and women in north Iraq to poison the waters of harmony which for so long quenched our thirst for peace. The Kurds and the Shi’ai will follow the policy of “divide and rule” concealed in the fine prints of a racist Iraqi constitution now accepted by all our Moslem neighbors in Iraq. They may divide our names, but they cannot divide our votes and our nationality. We may pray in different churches, speak a different dialect, but our hearts resonate to the rhythm of a single nation. The only course open to us all is to accept and respect one another’s differences, and recognize each other as separate but equal shareholders of a single and unique nation rooted in common history, religion, and language. So long as we do not recognize and accept each other as equal and interchangeable facets of a single nation, the idealism of a single nation cannot be attained. For many years Assyrians, myself included, brushed off the idea of a Chaldean or Syriac ethnicity and regarded it as the slicing of Mother Assyria. We must now end the deadlock between the Assyrian and Chaldean leaders. To accomplish this the Assyrians among us must offer recognition to the principle of Chaldean ethnicity—as a separate but equal component of the Christian civilization in Mesopotamia, equal to that of the Assyrians and Suryan or Syriac Christians. In the past our respected political parties worked hard to create a mold to bind these pieces. They chanted “One Name, One Purpose, One Leadership for One Nation”, elected an Assyrian, Chaldean, and Syriac to the presidency of their federations and universal alliances. Lastly, they even agreed on the name of “Chaldo-Assyrian” to stop the forces of disunity. All in vain, these experiments proved to be transient solutions to a more complex problem. To the chaos and hysteria our religious practices and political ignorance have brought about, we must now offer a practical solution. We must simply accept and fully recognize one another. An existing model to follow is that of the United Kingdom, where several ethnicities, religious denominations, and English dialects exist and are politically recognized as Great Britain. The aforementioned proposal is expected to be bitterly contested by all three major partners to our nation’s future: the Assyrians, the Chaldeans, and the Syriacs. Readers of this publication will say that the Assyrian civilization and Assyrianism is being divided along denominational and linguistic lines. Perhaps, yet we must seek strength in the unity of our differences compelling us to abstain from reaching common grounds. For now let us put aside the search for a common name, the historic reasons for our divisions, and linguistic differences. An Assyrian, a Chaldean, and a Suryan (Syriac) must begin recognizing one another as Assyrian, Chaldean, and Suryan– politically, ethnically, and religiously dissimilar, but each an essential component of a single nation. Apart from this we will be politically and morally defeated. On this day let us initiate the most colossal experiment in our modern history, that of conquering disunity through love and understanding, not political or religious clarifications. This will not be an easy task and the path may be long. But it must be crossed. To my fellow Assyrians I say that without attachment to anger or fear, accept fellow Bet-Nahrainaya as equal on this historic mission. It is not our guns or wealth, rather our unconditional love and respect for one another that will trouble the hearts of our enemies. For if history teaches us anything, it is that all roads in the future lead to our past, maybe even to the single foundation of our identities. His Holiness Patriarch Mar Dinkha IV, Patriarch of the Assyrian Church of the East, delivered a speech in Chicago last weekend at the Hanging Gardens Banquet Hall in Chicago to commemorate 29th Anniversary of his Consecration as Patriarch of the Assyrian Church of the East. His Holiness began his speech by speaking about the clergymen who have completed education at our own theological schools and were now in Rome for their higher education. He stated that the Church assists these clergymen with much of their expenses. Then he went on to describe his itinerary in details, a journey that took him one month and 22 days to complete. He began his journey with a visit with our people in London. Next, he arrived in Tehran on May 6, 2005. He stated that he visited Iran because our congregation there does not have a bishop and that he oversees that bishopric. The Patriarch described in detail his visit to Tehran and Urmia, how he visited the various churches, shared Holy Communion with the people, and how he ordained many deacons. His Holiness stated that he met with the former Iranian President, Mr. Khatami, and seven ministers in the Iranian cabinet and other officials, and that he presented to them the community's concerns. He stated that he participated in a conference that was attended by many religious leaders, representing various sects and beliefs in Iran, to discuss the means by which all these faiths can coexist in peace and harmony. The Patriarch later described in details his visit to Australia and New Zealand that began on July 14, 2005, after he stopped in San Jose and Turlock/Modesto area. In Australia, he participated in the ground breaking ceremony of a project to build 50 homes for the elderly and retired Assyrians. The patriarch visited with the Assyrian students of the Rabban Hurmizd Assyrian School and was very pleased with what he saw. He praised Bishop Mar Meelis for his efforts in this regard. After his return to Australia from a short visit to New Zealand, the Patriarch traveled to Canberra, the capital of Australia, where he met with the Iraqi and Iranian ambassadors and other officials. On his way back to the United States, His Holiness visited Los Angeles where he participated in the opening ceremonies of the Assyrian school at St. Mary's Church on August 21, 2005. He praised Rev. Gewargis Bet-Rasho for his tireless efforts for the community. The Patriarch continued to describe the efforts to construct new churches and halls in many localities. In Turlock (Mar Addai) School and hall are being constructed. A church will follow later. In Chicago, in North Brook, the church of Mar Andrious is in the planning and the Patriarch has blessed Mr. Andy Youkhana and his family for donating the land. In Canada, efforts are in the making to build the St. Mary's Church. The Patriarch praised Bishop Mar Emmanuel for his hard work and blessed him. Other such projects are undergoing in Detroit, and in Arizona, as Bishop Mar Aprim has informed the Patriarch. Furthermore, His Holiness mentioned that he was informed lately by Bishop Mar Giwargis that the new Assyrian school in Kirkuk is in its final phases of completion. Meanwhile, Bishop Mar Isaac informed the Patriarch that a church is being built in Ankawa and two others in Nohadra (Dohuk) in north Iraq. These churches are to be completed around Easter of 2006. The Patriarch stated that he will travel to Iraq after Easter to consecrate these new churches. Patriarch Mar Dinkha's next topic was the upcoming October 31, 2005 Holy Synod of the Assyrian Church of the East. He mentioned that the sole purpose of the synod is to address the relations with the Vatican. He stated that our communications with the Vatican begun in 1984 and led to the signing of the Christological Agreement of Understanding in 1994. Both the Roman Catholic Church and the Assyrian Church of the East have formed a 7-member committee that meet regularly. The committee of the Roman Catholic Church has two bishops from the Chaldean Catholic Church. Since 1994, and until 2004, the discussions between the two Churches have been about the "Seven Sacraments" of the two Churches. The Assyrian Church of the East has agreed on these sacraments and has presented its thoughts to the Vatican. The Vatican's response was received and they have made few small changes. The Assyrian Church of the East needs to meet in the Holy Synod again in order to discuss these changes and respond to the Vatican for the last time. Of course, the Patriarch stated that during the 7-day synod, all bishops are at liberty to express their thoughts and suggestions and if those thoughts are to the benefit of the Church as a whole, they would be accepted and implemented. The Patriarch stated that our responsibilities are first towards our own people and Church. The Patriarch stated that all churches must work together and unite; however, that should not mean that Churches must dissolve or mix with one another. He added that we as Christians must communicate with all other Churches to achieve Christological unity but not to dissolve into other churches or change and lose our own "Order," "Sacraments," "Liturgy," “Church Laws”, or the leadership of the church. Mar Dinkha stated that he believes in God, his Son Jesus, and the Bible, and he has always followed the teachings of God; however, he believes that nationality wise he is an Assyrian. He added that the Church's stance has been communicated to our political leaders that clergymen will not get involved in the political matters; however, he respects all Assyrians who work for the progress of our people. He added that he personally did not and will not get involved in politics because we have capable secular leaders whom if united and work together they could genuinely lead our ship to harbor of safety. His Holiness added that it was vital today that we achieve national unity in Iraq. The Patriarch stated that he believes the Assyrians, Chaldeans, Suryanis are of one nation and that if the secular leaders, various political groups, and civic institutions of the three communities extend their hands to each other and work together as one nation and for a united goal, then we could accomplish much. His Holiness suggested that every one of these communities should select a group of its devoted, educated, meek, patient, wise, and honest people in order to work together with their counterparts. He added that in Iraq things are moving fast and if Assyrians, Chaldeans, Suryanis continue to argue among themselves and defeat each other on who is first or last, we will remain in our places and attain nothing. The Patriarch asked the religious leaders of all three Churches not to get involved in the political matters and to leave politics to our secular people, political groups, and national institutions. He emphasized that if each of these communities worked alone we will get nowhere. 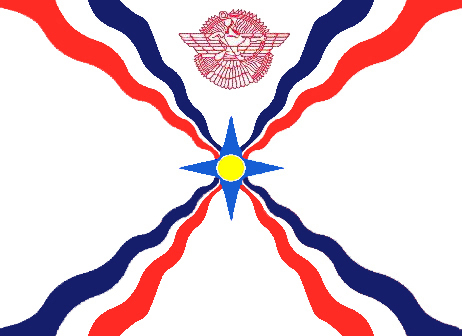 However, His Holiness believes that if these three branches of our nation worked hand in hand, then they could gain many rights in the future Iraq and will be capable of protecting the rights of the Christians in Iraq as well because Assyrians, Chaldeans, Suryanis are all Christians, sons and daughters of the Church of Christ. Patriarch Mar Dinkha stated next that he received a call from Dohuk from malik Shamisdin malik Gewargis of Lower Tiyari. The Patriarch stated that he was very happy to learn that they were rebuilding our villages (homes) in Barwr, Sapna, and other places and that our people are returning to their villages. He continued to state that he was glad to hear that our people were living in peace and harmony with our neighbors. Mar Dinkha stated that our people who live in northern Iraq, which, today, is called Kurdistan, must be in peace and love with their neighbors. Those who are sitting in the West do not know about the situation back there. Therefore, he asked that people not to judge those living in the East. Similarly with those living among the Arabs and the Turks, our people must live in harmony with them as well. The Patriarch added that we, today, could not get our rights by force because we cannot fight. Today, we must live in peace, love, and harmony with our neighbors in order to live comfortably. "As you have heard", stated the Patriarch, "in the last few years in cities and villages in northern Iraq, now being called Kurdistan, our people have opened schools and printed books in the Assyrian Aramaic language. It is great happiness that Assyrian, Chaldean, Suryani boys and girls are studying this language, as well as translating books to this language. They are studying this language in high schools, as told by Younadam Kanna, this language will be taught in other regions throughout Iraq as well. The new constitution declared that all ethnic groups in Iraq should have the right to study and teach their language, and preserve their belief in complete freedom. This Assyrian Aramaic language will bring us together because all three of our communities read it." The Patriarch stated next: "If you ask a Chaldean what language this is, he will say Chaldean language. If you ask a Suryani what this language is that you are studying, he will say Syriac. If you ask me what language this is, I will say Assyrian language. Therefore, all three of us are saying that it is my language. This proves that Assyrians, Chaldeans, Suryanis are of one nation." In his final remarks, the Patriarch congratulated Dr. Emmanuel Kamber and Mr. Sheeba Mando for their new positions as the Secretary General of the Assyrian Universal Alliance and Assyrian National Council of Illinois respectively, and wished them and those elected with them, well and success in serving the Assyrian people and blessed them. In closing, Patriarch Mar Dinkha supplicated to God to open the doors of mercy and hear the wishes of all Assyrians, Chaldeans, Suryanis. He asked God that Assyrians, Chaldeans, Suryanis work together as members of one "pisqa Ashuraya" (Assyrian flock). He prayed and wished peace and stability for Iraq and all people living in Bet Nahrain. (ZNDA: London) An Iraqi politician has drawn attention to what he says is the plight of Christians in the country, urged the international community to support a more liberal and more secular system for Iraq, after the vote on a draft constitution on Sunday. ChaldoAssyrians are gravely worried by the draft constitution, said Yonadam Kanna, an Assyrian Christian, and a member of the Iraqi National Assembly. He founded Iraq’s leading Christian political party, the Assyrian Democratic Movement (ADM). Of most concern, he said this week, is the statement in Article 2(a): "No law can be passed that contradicts the undisputed rules of Islam." Mr Kanna was speaking before a meeting organised by the Jubilee Campaign at the House of Commons, due to take place yesterday. Campaigners for equal rights for all Iraqis fear that the article could make Islam the dominant source of legislation, and pave the way for shariah law throughout the country. "There are a lot of positive things about rights in the constitution, but there are still double standards. It was more influenced by two main groups, the Shia religious groups and the Kurdish groups, and the language of the constitution must not be monopolised by them," he said. About one million ChaldoAssyrians — 95 per cent of Iraq’s Christians — remain in Iraq, after an exodus of half a million under Saddam Hussein. Since the fall of the regime, they have been the target of Islamic terrorists, and their ancestral lands and villages have been encroached on by neighbouring Kurds. There is also criticism that the preamble to the proposed constitution fails to recognise ChaldoAssyrians as the indigenous people of Iraq: it omits any mention of any other non-Islamic religion as preceding Islam in Iraq. "They speak about the history of the country, but neglect our grandfathers’ history of Babylonians and Assyrians. When they speak about the persecutions of Saddam Hussein, they just quote Arabs and Turks," said Mr Kanna. Johnny Michael, head of the UK branch of the ADM, said that the next few months would determine the ChaldoAssyrians’ survival in Iraq. (ZNDA: Ankara) Last Monday Turkey strongly condemned the inauguration of a monument, built in France in the memory of ''the victims of the genocide carried out by the Ottoman Empire against Assyro-Chaldeans in 1915''. Releasing a statement, Turkish Foreign Ministry said that a monument, erected in the memory of the ''victims of the Assyro-Chaldean Genocide of 1915 carried out by the Ottoman Empire'' was inaugurated in city of Sarcelles, some 30 kilometers away from French capital of Paris, on October 15th. Two Chaldean-Assyrian organizations assisted the office of the Honorable François Pupponi, the Mayor of Sarcelles (a Suburb of Paris); Michel Waksberg, Special Assistant to the Mayor, in charge of the Memorial in Honor of the Fallen Combatants. The presidents of the two associations, Mr. Naman Adlun, president of the Assyro-Chaldean Association of France and Mr. Stéphane Yalap, the president of the UACF, presided over the dedication ceremony of the Memorial Pedestal in honor of the victims of the Seyfo Genocide of 1915 which was perpetrated by the Ottoman Turks. The event took place on Saturday, 15 October 2005 at 11:00 A.M. [Paris Time] at the Stadium of Nelson Mandela, Paul Langevin Street in Sarcelles. To view photos from this ceremony click here. I would like to salute Zinda for the last two issues’ editorial and article: “Eat, Drink and Save a Heritage” and “The Dilemma of the Iraqi Draft Constitution and Looking Forward”. Both were efficient, distinctive and to the point. Moreover, both Wilfred Bet-Alkhas and Fred Aprim express genuine and constructive ideas on our national affairs in a professional writing method. A method that can only be found and enjoyed in Zinda Magazine. Chebo and keep up the great work. It was heartening to read the article: "Forgotten Victims - Iraqi Christians who Speak the Language of Jesus", in the sense that it is always encouraging to see people from all around the world voicing their views and commenting on the obvious ill-treatment of Assyrians and all Christians in the Middle East and in the case of this article, Iraq. It is particularly encouraging to see an article of the above's nature appearing in mainstream media areas like The Irish Times etc. Let's hope that all people in particular those working in areas like newspapers, television, radio and magazines take an interest in promoting the Assyrian people and the positives they provide to society as well as highlighting the negative things that effect Assyrians also, as seen in The Irish Times article. 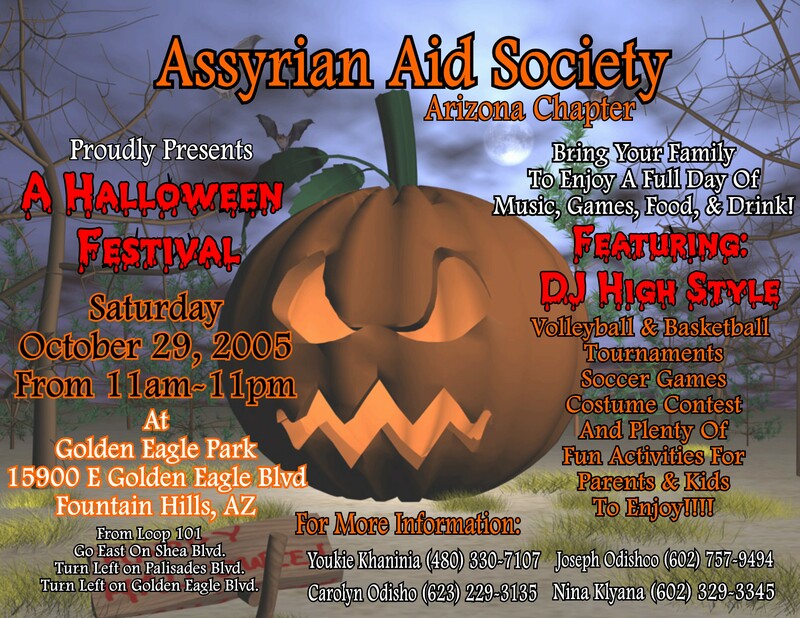 Do you have any idea for what reason the Assyrian Church of the East Synod is holding its first ever Halloween Party in our Assyrian Church history? Well, let me say that I happen to have some inside information that I would love to share with you guys. Most of the newly Kurdestany Church Prelates will be attending this meeting, which is going to take place in the windy city of Chicago, on this October 31, 2005. His Holiness, the Patriarch - the Godfather and his Mafioso-like Prelates - will be armed with all kinds and sizes of nails, hammers and big planks of solid teak wood, in order to erect the biggest cross ever in the center of Chicago. The style of the cross and the method will be very similar to the one that Saint Peter was crucified upon. The unspiritual Assyrian Judges will start the court proceedings to condemn and proceed with their court order accusing the Bishop of San Jose California, Mar Bawai Soro on the petition of 11 charges that were raised by some hypocritical members of San Jose Assyrian Church, which was definitely instigated by some close associates of our church leaders themselves. Churches) and the Unity of our ChaldoAssyrian Nation. Unfortunately, the leadership of the Assyrian Church of the East has got a different agenda than the one of San Jose. Do you get the picture? Mar Bawai, along with his faithful priests, should be punished, tortured, and finally crucified upside down according to the Assyrian Church of the East canon laws. Mar Bawai and his priests have not simply broken some minor Assyrian Church of the East laws, like having a part-time mistress or two, or misusing the church funds, or misleading the congregation. They have in fact blasphemed to the highest degree, by daring to announce a call for UNITY. The word unity is heresy to the ears of any Assyrian Nestorian Church Prelates, same as the word Nestorian is to the ear of any Coptic or Catholic Prelate. generation interest in the real teachings of Jesus Christ. Is this how our church Prelates reward their hardworking bishops? audited accounts instead of court marshalling those who dare to preach unity. the Assyrian Nestorian Church. Behind them stand the witnesses to the signatories Mar Narsai de Baz, Mar Bawai Soro, and Mar Meelis. Assyrian church has changed since then. Mar Bawai and his priests - simply because they had the guts to call for the unity of our Eastern Churches and for the UNITY of our ChaldoAssyrian NATION. We will support any Prelate from any of our Eastern Churches who sincerely and genuinely works for UNITY, and helps the needy Assyrians anywhere in the world, like Mar Bawai humble help for the needy Assyrians in Jordan, Greece, Austria, Iraq and Iran. What about the other Prelates from our church, have you taken any such actions for unity and charity? Recent media reports have pointed to grave concerns over voting irregularities in the October 15 Iraqi Constitution Referendum. The following is an article by Gareth Porter published on 10-20-2005 by the InterPress Service. The article is prefaced by an exerpt from the 10-5-2005 AINA press release forewarning potential Kurdistan Democratic Party (KDP) vote fraud in the critical swing province of Nineveh. A solid Assyrian rejection front towards the Constitution may prove to be the critical swing vote in the eventual rejection of the Constitution on October 15. Although the Assyrians now only constitute 7-10% of the Iraqi population (including those in the Diaspora), a significant portion still reside in the Province of Nineveh. According to referendum law, for the Constitution to be rejected, three provinces must vote "no" with a supermajority or two-thirds majority. To date, Sunni Arabs who are already steadfastly against the Constitution enjoy a majority in four provinces including Salah al-Din, Anbar, Nineveh and Diyala. However, in only two provinces, Salah al-Din and Anbar, do they hold a super majority. The province of Nineveh, the ancient Assyrian capital and heartland, has a majority Sunni population but also has sizeable Assyrian Christians, Yezidis, Turkoman, Shabak, and Kurdish minorities as well. KDP hostility and expansionism coupled with a widespread fear of marginalization and subjugation of Assyrians, Yezidis, Turkoman, and Shabaks will undoubtedly drive these communities to reject the draft constitution. As one Assyrian leader noted, "KDP threats, murders, and vote fraud in the last election have galvanized the minorities of the Nineveh Plain to reject the draft Constitution." Another analyst noted that "short of another bout of KDP vote rigging, election box blockages, and assassinations, Nineveh province will reject this Constitution." For Assyrians, the prospects of a failed constitution raise real fears of a generalized deterioration in security throughout Iraq. During such times, the very same minorities who end up rejecting the Constitution will probably disproportionately bear the brunt of more civil unrest. However, as one Assyrian leader noted "We are not rejecting the democratic process, Far from it. We fully support the democratic process and are making full use of it to clearly and loudly resist our marginalization. We do not believe this Constitution will lead to democracy in Iraq. On October 15, we will go to the polls and ask this government for a better, more democratic Constitution." Actor Heather Raffo asserts she did not write her one-person show, "Nine Parts of Desire," in which she stars, as a vehicle for herself. Its creation emerged from a much deeper place: her identity -- and pain -- as a woman of Iraqi heritage. "I'm an American, but I became aware of myself as an Iraqi -- had a sense of myself as 'the other' -- for the first time during the Gulf War," Raffo recalls. "I'd walk down the street and overhear people saying, 'Let's go f--k the Iraqis.' I realized from that point on that my cousins in Iraq -- family whom I loved -- would be viewed by many Americans as dark and dirty. 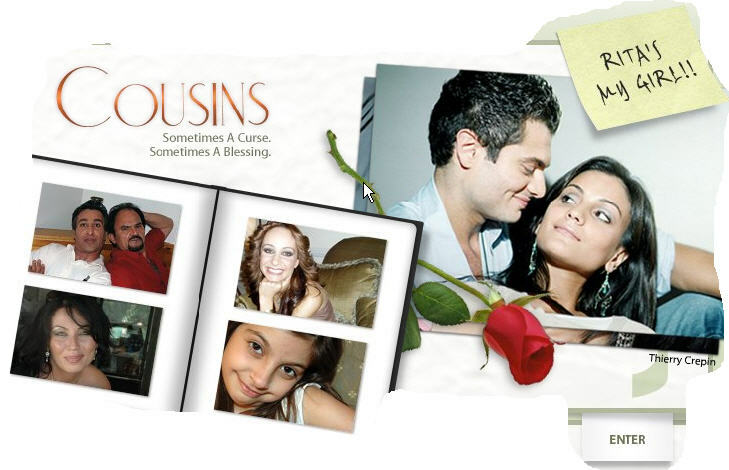 I also realized that the only difference between my cousins and myself was the accident of where we were born. That was my loss of innocence and, in a way, the beginning of this piece, although I didn't start writing it until I was in graduate school at the University of San Diego. It was my master's thesis." "Nine Parts of Desire," which bowed Off-Broadway at the Manhattan Ensemble Theater on Wed., Oct. 13, presents a portrait of nine Iraqi women from all walks of life -- from the most traditional (indeed, some are awash in mythic beliefs) to the most modern, calculating, and cynical; from those who feel anyone in power is an improvement over the brutality of Saddam Hussein to those who feel that President Bush brought only chaos to the region and ultimately betrayed the Iraqis. The play is based on a series of interviews Raffo conducted with Iraqi women and inspired by an aphorism from a Muslim text: "God created sexual desire in 10 parts, then gave nine parts to women and one to men." Raffo, who inhabits each persona fully, moving from character to character seamlessly, says that whatever their differences, "all the women are united by their desire to live fully. I chose the title because it has a certain resonance. It points to the complexity of these women." A highly animated, 34-year-old native of Okenos, Mich., Raffo, who punctuates her thoughts with a flurry of hand motions, meets with me in a Back Stage conference room, eager to talk about her worldview, politics, and the evolution of her show, which played in England last season and was selected as the best show in London by The Times and as one of the five best plays in London in December 2003 by The Independent. "I would love audiences to find these women -- many of whom may be alien -- familiar in some way," notes Raffo. "I'd love to hear an American say, 'That Bedouin woman is just like my aunt.' But at the same time, I want American audiences to walk out a little confused, not able to say, 'Oh, I get it,' but rather [to] understand how difficult it is to grasp the psyche of people who have lived under Saddam for 30 years with American support, then had a war with Iran, resulting in 1.5 million deaths, followed by 13 years of sanctions and two wars under American firepower." Still, in an effort not to create characters who are too foreign to Westerners, Raffo admits presenting the most secular, educated women, "softening the religious aspects, although many Iraqis are Christian, not Muslim." Indeed, Raffo was raised a Roman Catholic. Her American-born mother and Iraqi-born father, who came here as a young man to work as a civil engineer, are both Christian. Perhaps not surprisingly, Arab-American audiences have been the most responsive, Raffo reports: "They come to me at the end of the show with tears running down their faces. They recognize the women I'm portraying. One young man told me he lost eight members of his family because they didn't have a picture of Saddam Hussein on their wall. I had an Iraqi father and daughter come backstage with very different politics. The father kept saying, 'Bush is a miracle, Bush is a miracle.' The daughter didn't feel that at all, but they both loved the show. I don't know what Americans feel," Raffo continues. "They're less vocal, but I think they're enjoying it, with the exception of some middle-aged Republicans who saw it in Edinburgh, didn't get it, and were obviously turned off." Raffo wanted to act from the outset. 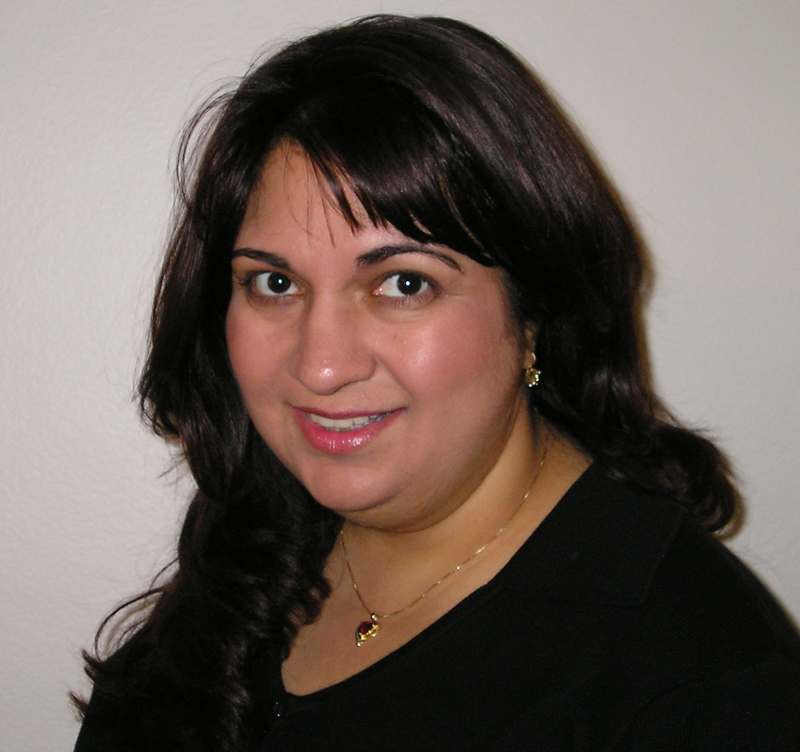 She earned her undergraduate degree from the University of Michigan in Ann Arbor, where she majored in literature, before heading off to the University of San Diego, where she received her M.F.A. Short of a brief dry period, Raffo has worked steadily as an actor in commercials ("which pays the rent") and in theatre. Some of her recent acting credits include an Off-Broadway production of "Over the River and Through the Woods," along with "Macbeth" (as Lady Macbeth), "The Merry Wives of Windsor" (Mistress Page), and "The Rivals," all with the Acting Company. Under the auspices of the Old Globe Theatre, Raffo acted in "Othello" (directed by Jack O'Brien), "Romeo and Juliet" (directed by Daniel Sullivan), "As You Like It" (directed by Stephen Wadsworth), and "The Comedy of Errors" (directed by John Rando). Raffo credits her acting experience in classical theatre as a significant -- albeit unwitting -- influence on her development as a writer: "It has allowed me to think mythically, poetically, and out of the box. There's nothing that prepared me more for writing than acting. Acting is about sympathizing and feeling with your whole body. And when I write, I'm in my bones, just like an actor." She adds that her acting background helped her with interviewing Iraqi women -- that and being an Iraqi, "which got me in the door, and being an American, which, oddly enough, made it possible for the women to trust me. They felt they could say things to me, as an American, that they wouldn't allow themselves to say to another Iraqi." Raffo insists that while she defines herself as an Iraqi-American (equally American and Iraqi), being a woman is what most shapes her. "What's missing in the world is the feminine balance," Raffo suggests. "I'm not talking about female empowerment, but rather the combined energy of the male and female in everybody." Raffo's most significant artistic influence is Ntozake Shange, a feminist playwright: "When I first read 'For Colored Girls Who Have Considered Suicide/When the Rainbow Is Enuf,' I felt I could write too. I felt it came from my blood. If I ever meet Ntozake, I'm going to hug her." Raffo continues to view herself essentially as an actor, but writing has given her a chance to "integrate my voice in the process. I wish that were true for me as an actor, where only a part of me is used. Acting in my own one-person show is the best way to go for integrating all aspects of me. But, truthfully, I don't really care for solo shows, unless they really enhance the material." Raffo is not entirely sure what she'll do next: "My real ambition is to appear in movies. I never really wanted to do theatre, although I believe the best training is in theatre. And before I did this piece, I dreamed about doing all the great classic roles. I no longer feel that need. In fact, I'm angry when I think about some of the classics. Why is everyone suddenly doing Greek plays to talk about Iraq? Why don't we go to the Iraqi artists when we talk about Iraq? Or unearth our own stories -- new stories -- that deal with Iraq?" She adds, "I'm not talking about topicality, but pertinence in a deep way."